This has been a game that's been a dream project for retranslation just because of its popularity and subject matter. However, there was a minor roadblock that prevented it from happening for a short time. The storage of the script used what is called Pascal strings where no end control codes are used and instead a byte is used setting the length of a string and thus when to stop. This method is usually not handled by generic script tools and we needed a custom solution. Fortunately, a good friend of ours and excellent programmer and hacker, Esperknight, extracted the script and work got started. A help wanted ad on RHDN(A favorite feature for the best site and community on the internet) was put up and almost immediately contact was made with an excellent translator. Many a translator, associates and friends haven been found through the help wanted ads over the years and this development comes as no surprise. catfoodmoney diligently translated the script and work resumed on the project. First thing that needed to be done was to hack the big 16x16 font down into a much nicer 8x8 font, that was a piece of cake. Because the game used the big font and plenty of kanji, there was plenty of space leftover when the font was replaced which was used to relocate part of the script. We ended up with over twice the physical space for the translation and more than enough room for a quality translation. Also the game had a few limitations that were very annoying. 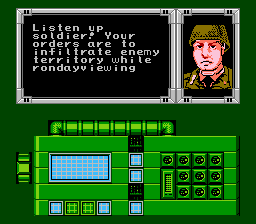 The game was capable of multiple screens of text per text string, but you first had to fill the screen before it would be cleared. A control code was added so that the screen could be cleared anytime. Also because of the Pascal strings, the text was limited to #$FF hex bytes which equates to 255 characters. This limitation did not work with some of the longer strings and something had to be done. So the Pascal strings were replaced with a simple end control code and the limitation overcome. Shoutouts go to FlashPV for the really cool title screen and Carnivol for being a diligent tester. That word should be "rendezvous" in the second picture. That was an intentional misspelling. EDIT: If the idea is that he's mispronouncing the word, then hyphens ("ron-day-view") or quote marks would help. Love that Hercules theme song. This really isn't too great. I noticed at once that texts appear far slower now. I even compared with the original, where you can switch between destinations much quicker on the map screen. Then there is a strange colourful horizontal flash after a level is beaten, just before the debriefing screen. A minor flaw really. The actual translation is also quite absurd. All those 'v's and 'k's make it harder to read. The instruction txt said profanities were mild. I only played maybe 3 levels until now, but already in the first boss section the commander said "Schweine Ficker"; the meaning shouldn't be hard to guess, it is someone who f##ks swines. This isn't even a common insult, it rather feels juvenile in its "creativity". But maybe it is a good choice for this purpose as an English speaker can easily approximate the meaning. Still, for it to be convincing, a common insult like "Hurensohn"(son of a whore) would be more fitting. Well first the technical stuff. That quick flash was something I hadn't noticed until now. I will fix that. As for the text speed, I suppose I noticed that, but I never really considered it an issue. There is a slight gap in time between text. I'll look into that as well. I think the game is juvenile and absurd. I've also already used hurensohn elsewhere in the script and I didn't really want to repeat too much. Although I will admit Scheine Ficker is a bit over the top and can be changed to something else. Also the 'k's can probably go. There is a legit issue, however minor it may be, so the patch will be updated at least once. Update: I've fixed all the technical issues. That flashing bug was caused by an errant byte. As for the slower text speed, the text is printing and consequently clearing the screen at the same rate it was for the original bigger, but only in this case there are more characters. I had initially modified the clearing routine to clear only 8x8 pixels instead of 16x16. The game however clears the entire text area regardless if there is text there or not. That was the reason for the delay between text on the map. The game is still clearing the screen while you are waiting for the new text. It's not a problem anymore. Where is the Top Secret logo? Seems strange to translate the whole game and then remove the original title. It was a matter of personal preference and I wasn't too thrilled about keeping the original title. I'm not the only fan translator to do this btw. If anyone has any issues with the translation/patch, now would be the time to tell me so I can take them into consideration. I've finished the update and also consequently need someone to run through the game before I release it. If you still need someone to test new version, feel free to send it to me. I was planning to do a full run until I notice the slow text, I couldn't stand it testing should be done rather quickly. I agree with the other person who said that if you don't write that line like "ron-day-viewing," people will actually think it's a real typo. Also, why are the W and M characters thinner than the other letters? Because it's a small fixed width font, and if you make the lines bigger they'll blur together and can't be distinguished anymore. How about something like this? It's 8x8. I grabbed the font from another game, so it was like that originally. That said, you do have a point and I've added a few rows of pixels to make them more consistent with the others. The patch has been updated. Once it's approved, please redownload the latest version. For reading's sake, I think not having so much German accent written into the text would help. Granted I understand what's going on but I'm sure many folks are complaining about it. Was the difficulty changed in this hack or was the original this different from the US version? I like the the new title screen myself. It gives it a localized feel IMO. If I had changed the difficulty there would have been some mention of it. But no, it's not uncommon to find various regional differences especially with NES games. I am quite satisfied with the script and I even slighty toned down the German accent in the update. I didn't just create the accent with some random site or my imagination, the final accent was created with the help and feedback of a few Germans. It's really a matter of opinion and my opinion counts most. I like it and really the only problem I can see with it is that it might make the somewhat difficult to understand in parts for people who are not native speakers and don't have the greatest grasp of English. If people are complaining about it, they're doing it silently. The only real criticism/complaint has been from a German who I'm guessing wasn't too jazzed about the accent in the first place. As for the whole title screen thing, I feel that Top Secret is a dead name. 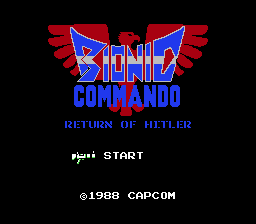 With the revival of the series in the West, calling the game Bionic Commando seemed more appropriate. Plus I like the name better. I like Bionic Commando better as well. This was one of my favorite games as a kid so playing it translated like this is awesome. So, there's going to be an update in the next few days. It was brought to my attention that I broke the prisoner torture part of the game and I can't just let that be. It's the best part about the game. I also saw a font that M-Tee designed that looks like that font from Metal Gear, but with a lower case too. That'll be in the new patch as well.